My grandfather listed his birth location and that of the rest of the family as Tscherkassyi, which is the German name for Cherkasy. The family left Cherkasy in 1923. Does anyone have information about this family? Our family came from Cherkassy. While growing up in the East New York and East Flatbush neighborhoods in Brooklyn, I often heard my relatives speaking of their past. They were victims of the last pogrom in Cherkassy. During the pogrom, a neighbor got drunk and told the Cossacks about my mom's family dwelling. My grandfather wasn't home at the time. The Cossacks left, assuming everyone was dead. My grandfather's hair turned white overnight. My grandmother and two boys were killed. My mother lost a rib, and her sister was wounded in the leg and suffered for many years. According to mom, the neighbor who got drunk liked my mom's family and committed suicide afterwards. My mom's surviving brothers had the rest of the family brought to America. This was in the 1920's. An aunt, who was older and remembered more, stated that their dwelling was among large orchards, and it would have been hard to discover it had it not been for the drunk neighbor. I visited my mom's cousin in Odessa some years back. My mom was eighty at the time and didn't want to go. We found relatives, by way of a friend, who lived in the Ukraine. My family had no knowledge of them, or contact with them, until the 70's. My mother was born in Cherkassy as Ester-Malka Povolotskaya on 30 January 1904. She came to USA in 1908. Her mother's family name was Actiorsky (Actor here), her maternal grandmother's family was Slutsky and her maternal great grandmother's family was Cantorsky. Her paternal grandmother was Czerna. My grandfather's mother (Czerna Povolotsky nee Tverovsky) and one son and one daughter immigrated to Fall River, Massachusetts which seemed to have a large group of people from Cherkassy. Most of the families came to USA before 1914 except that my grandfather (Sam Palow/Povolotsky) was the youngest of 13 children and only 2 of his brothers and 2 sisters emigrated here. I visited Cherkassy in 1997 and met with an archivist there who was able to be of a little help. I think that the Povolotsky family was originally from Bogoslav but have no records from there. Here is information about my mother's family. The family name is SAFYAN. Her father and my grandfather, ISRAEL SAFYAN, was, to my knowledge, born in Cherkassy, Ukraine, in or about 1880 or perhaps a bit later. He came to the United States in about 1900 and settled in PIttsburgh, Pennsylvania. As late as 1923 his family, also SAFYAN, including his mother, sister and a nephew, were still in Ukraine. They came to the US later. Bulgaria, as well as the former Yugoslavian republics. The name could also be Armenian in origin. My Great Grandmother Ester Savatski and (her son) my Grandfather Jancil (Jack) Osikowski (Oskin) (see Ellis island information below on my their trip to America) came over from Hamburg from Cherkassy on a ship to Ellis Island in 1923. My grandfather changed his last name when my aunt Ruth was about to start kindergarten and Americanized our last name. My father Arnold Oskin is quite interested in Cherkassy. I do remember hearing that my grandfather was a "tailor" and was able to sew. I am not sure he did this in Cherkassy but I do know that he did this at some point. I do remember is that my grandfather had to hide in graves in the "Jewish cemetery" when the Cossacks came. I was told that my grandfather Jack's family either owned the cemetery or were cemetery caretakers at some point in Cherkassy. GEORGE SCHIMCOFSKY was born in Cherkassy, Russia, and died in Russia. George married ANNA GINSBURG, who also spent her entire life in Russia. Their son was LOUIS SCHIMCOFSKY (b. 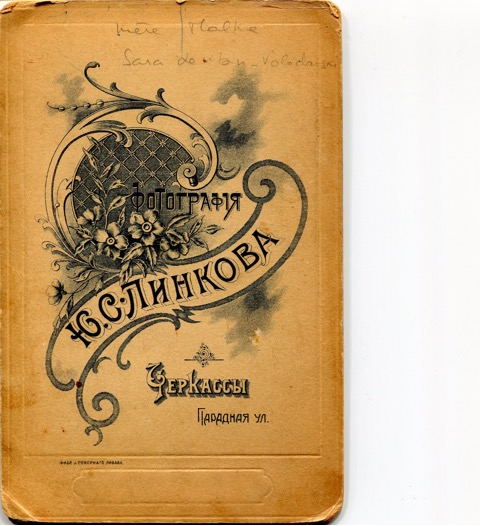 1855, Cherkassy, Russia; d. Feb 1932, New York). He married IDA TSIRILSTIEN 1872 in Russia, daughter of YEHUDAH REYENTOWITZ and NACHA TSIRALSTEIN. She was born 17 Jul 1856 in Poland/Russia, and died Jun 1937 in Queens, New York. Ida went by her mother's maiden name or previous name, (Tsyralstein, not Reyentowitz); it seems that she had a different father. Her death certificate indicates her father was Judah Tsyralstein and her mother's name was Sarah. Louis changed the family name to Shimm. 1. ISRAEL LAEB SCHIMCOFSKY, b. 29 Oct 1873, Cherkassy, Russia; d. Aug 1944, New York, NY. 3. ANNIE SHIMM, b. 1878, Cherkassy, Russia; d. May 1952. 4. ABRAHAM SHIMM, b. 19 Dec 1881, Cherkassy, Russia; d. Jul 1951. Louis Schimcofsky and his eldest son Israel, age twelve, were the first of their family to immigrate to America (I believe in 1889); Ida, Louis' wife, and their Russian born children came one year later. When Israel and his father arrived, they lived with a family named Feinberg until they were able to afford their own apartment. When Israel attended school he was registered as a Feinberg, thus creating a Feinberg family record. Annie Shimm married Julius Golding (b. Cherkassy) in New York City in 1902. He was of a cousin, the son of PHILLIP GOLDING and NACHA REYENTOWITZ. There are quite a few professors in the Shimm family history. I am trying to track down the town from where my grandfather emigrated; he arrived in Montreal, Canada. From my research, based on my grandfather, David Sloan, becoming a naturalized Canadian citizen in 1910 (see Act of Naturalization), he arrived from "Cher Kos, Province of Kieff, Russia" around 1901. My family story is that my great-grandfather Lev (a.k.a.,Leb; Leib; Leibe; Lejba), father of my grandfather David Sloan (Yaakov Duvid) , came from Cherkassy to visit his son in Montreal around 1910, but then returned to Cherkassy only to be killed in a pogrom. I suspect that my great-grandfather was born around 1855 and most likely died before 1930. If my memory serves me well, my late father told me that my grandfather left Russia to avoid being drafted for the Russian invasion of Manchuria. From other Jewishgen data that I have found, there were three Rabbis in Cherkassy in the period 1880-85. They were Twerski, Elkin and Sultanov. My wife's father was a Sultanov who left there in 1895. His name was Motl Sultanov, son of Mordecai. The Sultanovs were related to the Elkins. My mother-in-law's mother was from Cherkassy. Her name was Ester Rochel and she was born in 1890. Her parents were Shaindel and Hirsh. 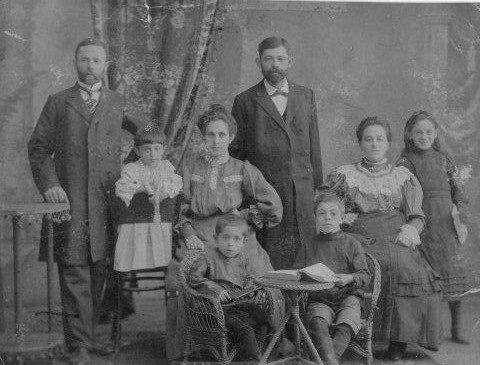 They had 5 children: Mordechai Motle, Laibel, Abe, Ester and Freida. In 1912 Mordechai Motle came to America. He then went to Canada and brought his mother and siblings over. His father had died in Russia. My Mother was born in Cherkassy in 2011. The following story took place during the pogrom of 1919. The Cossacks entered my grandmother’s house and shot everyone. My grandmother, her 2 year old baby and 12 year old son were killed. My mother and her two sisters were thought to be dead but survived. My grandfather was away at the time. A couple of years later, my grandfather and his 3 daughters came to America. They had 2 sons who luckily were already here to avoid going into the Czar’s army. My mother always wanted to go back to Russia to see the graves but realized that there would be no graves. I wonder if there is some kind of list of all the Jews who perished during the pogroms. I wonder if there is some kind of list of all the Jews who perished during the pogroms. If only Yad Vashem could have documentation of these massacres. My mother and my two aunts are no longer alive. If you anyone knows of any information about the people involved in these massacres, I would greatly appreciate it if I could know where to look. I thank you in advance for any information you may give me relating to this dark side of our history. My paternal grandmother, Itke Tulczinsky, was born in Cherkassy, circa 1885, as was her brother Abram Tulczinsky in about 1887. Another sibling, Golda Tulczinsky, was born in nearby Aleksandrova. Two other known siblings were born in the Kiev area. And some close relatives were born in nearby Medvedovka. My paternal great-grandmother Sima Liba was a Uditsky. At the present time, we think the family moved to Cherkassy after 1850. I have a copy of an 1850 revisionist list for Mashony. The family name also appears there. I wonder if there is any connection. My paternal great-great-grandfather is in bold print. Sima Liba is one of his children. She is listed with a couple of her siblings. Here is part of the Uditsky tree which mentions Cherkassy.
. ABRAHAM2 UDITSKY (MOSHE TZVE/MOSHE1 ZUI) was born 01 Oct 1864 in Cherkass, Kieff, Russia, and died 21 Aug 1938 in Fall River, Massachusetts. He married LILLIAN Bef. 1886 in Russia. She was born Abt. 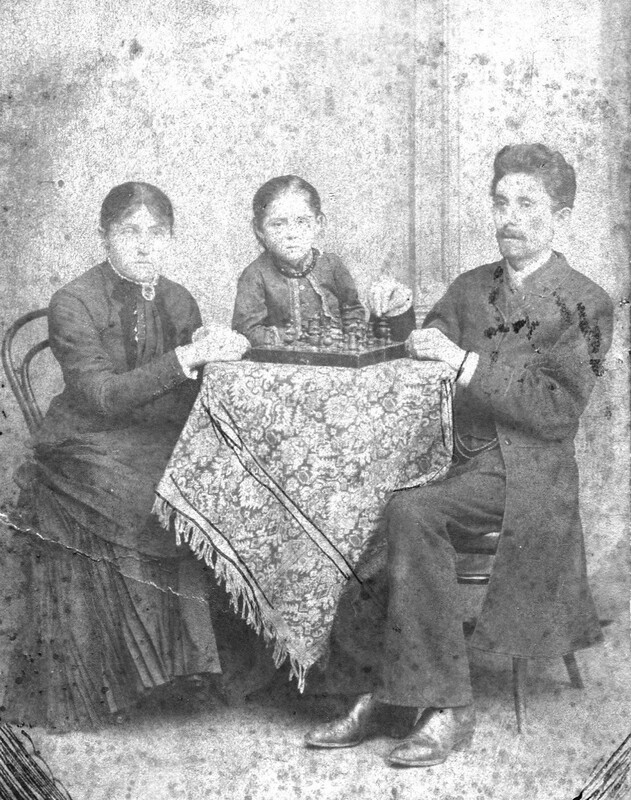 1870 in Cherkassy, Russia, and died 24 Jan 1940 in Fall River, Massachusetts. 24. i. TEAVY3 UDITSKY/UDIS, b. 22 May 1887, Cherkass, Russia; d. 01 Jul 1959, Fall River, Massachusetts. ii. MORRIS UDITSKY, b. 01 Nov 1891, Cherkassy, Russia. iii. LOUIS UDITSKY, b. 01 Jul 1894, Cherkassy, Russia. 25. iv. Bertha Uditsky/Udis, b. 15 Mar 1898, Cherkassy, Russia; d. 21 Nov 1996, Palm Beach, Florida. v. Jacob Uditsky, b. 28 May 1901, Cherkassy, Russia; d. 05 Mar 1995, Bloomfield, Connecticut. The table below lists what I found on Jewishgen for two of the towns the UDITSKY family came from. Below is a 1940 photograph of Sima-Sarah (English name) on the right and her sister Feige- Fanny Uditsky Loeff Dashoff; they both lived to be over 90 years old. I have many letters and photographs about my family. I also have a bit of information about the family from Uman (the family of my grandmother's first husband) and a bit about the of my grandfather’s family from Kamenetz-Podolsk. For a very long time, my grandmother didn’t spoke about her life and never about her origins or about my grand-father. That is another story, which would take a long time to tell. My grandmother: (I am in the middle of writing about her life). Malka Volodarsky (Marussia) was born in Cherkassy on September 15, 1887or 1888. She died in November 1963. She was the second child of Boruch Volodarsky and Sarah Levitan. Boruch (1866 ?-1905/7 ?) He was married off at the age of 15. He gave lessons in Russian, German, etc. to young Jewish people who wanted to be accepted to the Gymnasium- high school. They had to work hard to be accepted in Gymnasium because of a “Numerus Clausus” (restriction clauses for Jewish students in the Gymnasium). Baruch died of tuberculosis in 1905 (I am not sure of this). Sarah Levitan (1860 -March 3, 1915) She married Baruch at the age of 20. She was 5 years older than him. This was then considered marrying at an old age. The couple lived with Sarah's parents. The Levitan grandfather was a tailor. He had a small house on the outskirts of Cherkassy with a small garden. Sarah often went to the market place. After her husband died, she lived alone in Cherkassy. She died from tuberculosis and from misery in 1915. She was 54, when she died. The children were not healthy; they all had rickets and this disease caused many big problems. (Boruch went to Kiev to consultation for Marussia . At the age of 2, she had special orthopedic equipment made for 1 leg. It was of metal and very heavy. They all had a good education. The children were not religious. They all learned Russian, Hebrew, and Yiddish. The mother spoke only Yiddish; but children spoke Russian together. Marussia and Polya left Cherkassy when they were very young. Polya got engaged to (Choulka) Israel Sokolovsky, who lived in Uman. At that time, he was still student. He became an engineer. They both studied in Kiev after high school. She studied to be a teacher. She did not work too much in this profession. They all studied in Sverdlovsk and afterwards in Kazan. My family lost contact with them, until 1936 when Choulka was probably arrested for the second time. He had been previously arrested in 1930 and put in prison for 1 year. He was freed in Sverdovsk, and nominated for a high position in Ouralmach. In her letters, Polya wrote: ”he is sick and we would need to spend 1-2 years in a climate fitting for our health/recuperation”. (Perhaps he had been arrested and had to go to jail or was to be killed?) They used to give news about their being arrested, by writing if they were sick or not. Polya corresponded a great deal with her sister. She also had contact with the American branch of our family. (Volodarsky and Sokolovsky). They corresponded in Yiddish an in Russian. Maybe there was something about the death of Polya in Yiddish from the aunt; but my grandmother never told me about it. She also tried to find out something about it for many years. Lev was weak. His sister Polya always took care of him. In 1904, he cried because of the death of Herzl. Marussia cried because of the death of Chekhov; but at least he was a Communist. My grandmother used to tell me about that: ”now you can understand everything”. I did not understand anything at all. Lev became a revolutionary, and he suffered because of this. He became a real Communist. He studied to be a pharmacist and went to work in Arzamass. He married and afterwards died of tuberculosis. He had previously received treatments many times and spent time in sanitariums for members of the Communist Party. She was very poor; but her life was full of culture and revolutionary activities. Her first husband wrote that she was the most beautiful girl in Cherkassy. Abraham wrote that the photographer had placed her photograph in his shop window in Cherkassy. She said that she had once witnessed a pogrom, when she was young. The Jews had then been warned beforehand. Therefore they closed and barricaded all windows and doors. It took place on the Easter holiday. She studied for 3-4 years in high school in Cherkassy. At the age of 15, she ran away from home. I think she was part of the forming of a political group in the “Gymnasium”, which was forming politically, by going to Odessa. She was a member of a revolutionary party. It was the Populist party, and its' real name was "Narodnitchestvo". The word "Narod" means people in Russian. She then hated communitarianism. She desired to be Russian, more than anything else. At the end of her life she just wanted to be a citizen of the world. She was engaged to the young revolutionary Joseph Levine. She knew him from the gymnasium (high school). He organized the revolutionaries. Therefore she talked a lot about the sugar factory of Cherkassy and the Russian Japanese War. I did hear much about the sugar factory and the wretched condition of women who worked in factories. After the revolution of 1905 Joseph Levine was deported. He succeeded in saving himself by escaping to America in1907/or 8. He found my grandmother's address in Paris and wrote her 2 superb letters about his life in America. He wrote that he can’t stand “spinelessness “of people in Tcherkassy and that he stopped being interested in people he had previously wanted to help. Therefore he went away to America, which was where his parents lived. The last time she heard from him was in 1914. I hope he did not return to the USSR. Maroussia met Avraham Feinstein in 1905 and left Joseph. He was a young revolutionary, a poet and a bit crazy. He was the son of an alcohol merchant (Khakhmil Feinstein), whose business was located opposite the post-office in Uman. They were madly in love. They crossed the plains of the Ukraine together. He spoke Ukrainian and was very proud of it and was very enthusiastic. She was very free. He was arrested in 1906 and put in a prison that was close to Kiev and then deported to Arkhangelsk (in Piniega). She became engaged to him and she followed him. He escaped to Paris in 1908. She lived with Abraham parents. She only rejoined him in 1910, when they were already separated; but he wanted her to know about culture and life in Paris and to be free with him, even though they were no longer together. He wrote very long letters about spectacular Isadora Duncan. Soon after, Maroussia met my grandfather Serge Romoff (Salomon Roffman), who was from Kamenetz-Podolsk. He had arrived in Paris, in 1906 and was already “a real Parisian”. She returned to Russia twice, in 1911 and 1912, to obtain a legal divorce from the Rabbi of Uman. She began a new life as a “boheme”, in the artistic world of Paris, between the Ruche and the Latin Quarter. Romoff becomes an art critic for l’Ecole de Paris. He returned to USSR in 1928, leaving his wife and 2 children with hardships in France. He was imprisoned in 1933 for the first time and again in 1936 and died in February, 1939 (Internet). He was possibly shot; but I think this is false information. When I was in Moscow, I met a person at the Memorial who tried to help me; but she did not find him on the list of people who were taken to be shot. Genia, who was my mother (born, Paris-March 20, 1913; died- Paris February 2, 2011). She married Pierre Courtade who became a journalist and a writer (see internet). They separated in 1955. Boris (born, Paris –August 30, 1915; died, - April 16, 1939). He suffered from tuberculosis. From the age of 14, he spent many years in a sanitarium. He stayed a long time in sanitariums in Switzerland, and then in France. For a few months he was an assistant journalist at "Oran Républicain". He had a relapse of tuberculosis and came back to died in France some days after at the age of 23. Avraham returned to Russia in 1911. He completed his law studies and went to Moscow. He met Romoff there and they spoke together about Maroussia. My brother Serge had started to study "Arts Decoratifs".in Paris. He died in a crash car at the age of 20, on April 17, 1962. Some months afterwards, in May, 1963, my father died. It was too much for Maroussia and she died in November 1963. Sylvie (myself): was born in the little city of Auch in the south of France, on July 12, 1944. Then our family lived (including Marussia) with our French grandparents. We were very close to this family. I worked as a psychologist. Now I am retired. I have 2 children and 3 grandchildren. Here is information about the rest of the family. Aunt Shifrah Ostroff, and her family lived in the USA. The family numbered about 15-20 people. The lived in Philadelphia and N.Y. They helped the family that stayed in Europe, with financial aid, when they could. . They were all married in the USA. One of the sons, Yaruss, became a comedian. Some kept contact. Aunt Shifrah Ostroff corresponded in Yiddish. Her daughter Mania Yarus wrote in Russian. Some family members corresponded in Russian; but everybody spoke English. Some could speak Yiddish; they did not write it. I have a strong memory my grandmother reading the letters from my aunt. It was very difficult for her. After Aunt Shifrah died there was little correspondence or contact with our family in the USA. This is a photograph of a group of students in Cherkassy. Maroussia Volodarskaya is sitting on the ground, holding her hat. a white blouse (second to the left on the second line). Cherkassy. Joseph Levine is sitting on the left, holding his cane. Maroussia (Malka) is sitting just above him. My family (Wolodarsky) came from Cherkassy and Moshna, Cherkassy. My earliest record is from Bluma Loif, my great great grandmother who died in Philadelphia in 1918 at age 80. Her husband was Moishe Hersch Wolodarsky. They were born about 1830 and lived in Cherkassy. See Memories: Family Trees: The Nettie Marcus Family (beginning). Her Mother's name seems to have been different in family listings and in official listings.